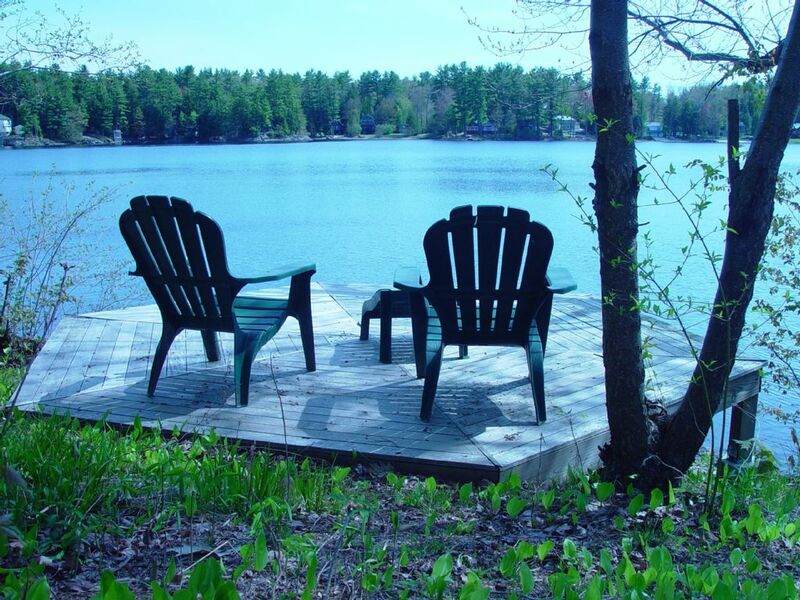 Our house, meant for all seasons, is a waterfront vacation cottage on the shores of the tranquil Emerald Lake. You can take in the stunning lake-view from the dining area and living room through the glass sliding doors, which open to a deck with southern exposure. The deck is a wonderful place to have coffee or tea in the summer. Early in the morning, as well as during the twilight hours, you might catch the high-pitched laugh of a loon swimming through the morning mist. In the summer, the lake is a clean and refreshing place to swim. From the deck, you can walk through the wild flowers to the water and jump right in! There is also a rowboat, kayaks, and a canoe, among other boats, that are available for a small fishing expedition or a leisurely paddle. Just a 10-15 minute walk down the road, there is also a small sandy beach that provides easy access to the water, as well as a floating dock to relax on. In the fall, enjoy the spectacular foliage as you hike in the near by Fox State Forest. The forest and the cottage are ideal places to relax while recharging your body, mind, and soul underneath the changing fall leaves. Winter offer activities such as ice fishing, skating on the lake, cross country skiing, or alpine skiing. Pat’s Peak and Mt. Sunapee are nearby ski-mountains with trails for all levels of alpine skiers. In the spring, join the anglers who come from all over New England to fish for trout, pickerel, and bass. To view the spring buds growing on the trees, you can also trek the trails of the near by Fox Forest State Park or tour the panoramic Monadnock Mountain view at Kimble Hill. The nearby town of Hillsborough has a commercial district, where shopping for groceries is made easy. Feel free to explore Hillsboro historic center and its scenic surrounding. Next door, the quaint town of Henniker, home to New England College, also boasts of some fine, local restaurants. Water front house has a small sandy place and a dock to swim from the shore.This is not recommended for unattended children, and non swimmers. There is a nearby wading beach one can walk to..
Land-line phone with unlimited long distance in the US. Open floor plan kitchen , dining and living room. Games and some toys available in library. Hexigonal deck at the water's edge. Enjoyable and relaxing! Great time with close friends and family. Couldn't ask for more. I enjoyed our correspondence please that you enjoyed your stay. We hope you’ll have a chance to to come again. We had a great stay... the quiet and beauty combined with the great home was ideal! We came from eastern end of Long Island via the ferry... with our two Cairn terriers (who enjoyed their many many walks). The serenity of the house and the lake side presence and view contributed to my future writing project. The house had all the amenities any guest would need or want. We all enjoyed our stay... yes our doggies told us in their way that they enjoyed themselves. Charlie was very proactive and kept in touch. This house was exactly as specified and we had a very pleasant stay. Very private and very restful. I loved the 6 sided deck right on the water. Added bonus of having actually dark nights, compared to the city. Will definitely go back! It has been a pleasure having you as a guest. you found some fun activities, and charm. I happen to stop by the day you checked out. You know there is a house keeper. You left the lake house imaculant. We are please that you found our retreat serene. You expressed your interest in returning, and you are most welcome. Charlie is an amazingly wonderful host. The house is so comfortable and we had absolutely everything we needed. We fell in love with Emerald lake! Unfortunately, our vacation as much fun as hoped because of very bad weather. But we were able to enjoy the little bit of sunshine we had to the max! I know the weather was stormy on the lake much of your stay. I am glad that you were able to still have some quality time. The area is rural with some quaint towns nearby. The house is on the Hillsborough side of the Hillsborough/Henniker line. Hillsborough has an old Historical Center; a visit there is like taking a trip back in time. There is a one-room school house, some old churches, grave yards, and an Art Gallery. You can also visit the barn workshop of the Gibson Pewter Craft and see cups being turned. Hillsborough also has a more commercial district with an old fashion ice cream parlor, Peter's German Bakery, and Tooky Mill's Pub & Restaurant. Down on Main Street, you will find a Shaws Market, among other amenities. Henniker, home of New England College, boast some excellent restaurants including the Colby Inn, for special occasions; the Country Spirit, for that local feel; and Daniel's Restaurant, which over looking the Contocook River. Pat's Peak, in Henniker, is a wonderful family ski destination. Mt. Sunapee, another wonderful ski destination in Newbury, is also just a short drive away. Weekly $ 980 -$1680, Generally Minimum 3 nights on holiday weekends. Please inquire for rates.